www.PowderBulkSolids.com 11 J u n e 2 0 1 8 could cause the blade to deflect from its intended path, or even permanently bend. It is very important to know if the gate will be closing on a head of material, as this will influence the selection of the gate and any necessary options. Another important consider- ation when selecting a gate is the weight of the material that will be passing through it, and if the gate will be required to sup- port a column of this material in the closed position. This is very important since if overlooked, the weight of the material rest- ing on the blade may cause the blade to bend causing leaks, or worst case, fail completely, which could not only create ma- terial wastage, but also pose a significant safety risk. In order to combat both prob- lems various methods of support are used. Some gates utilize full length blade supports and guides, which support the blade along the edges along the entire length. The supports/guides can be metal, or a low friction plastic. These supports/guides can also be an integral part of the sealing mechanism to prevent pressure and material loss. Due to the de- sign, these types of supports in- troduce an element of friction on the blade. Typically this is not a major concern as the gate manu- facturer will have compensated for this in their gate design, how- ever can lead to problems if the gate is cycled at a rate higher than it is intended for. Rollers can also be used to sup- port the blade. Rollers tend to be more robust and are used in applications that require addi- tional support, such as those for the aggregates industry. Rollers can be constructed from various materials such as Teflon, nylon, or steel, and are intended to pro- vide support to the blade while also eliminating the friction that is present if using solid guides. Wear Anytime a material moves in contact with another there will be wear. Depending on the ma- terials in contact, the wear may occur on one surface or another, or on both. This is true for gates as well. Wear will occur on the gate surfaces or on the material passing through it, or on both. However steps can be taken to reduce the amount of wear or to control the wear. The blade is the central com- ponent of the gate and due to its operation, is exposed to the material stream and is subject to wear. Gates are designed to reduce the amount of wear on the blade in order to increase the life of the gate. When in the open state, the blade should be fully retracted outside of the material path, so that no mate- rial comes into contact with the blade. The tip of the blade can be cut with a bevel, so as to part the material stream more effectively (a sharp edge vs. a blunt edge.) Wear will also occur on the sides of the gate. Wear liners, which are made from the same material as the gate or a more resilient material, can be incor- porated into the gate. Wear lin- ers are typically replaceable, so when they do eventually wear, they can be replaced easily with- out replacing the entire gate. 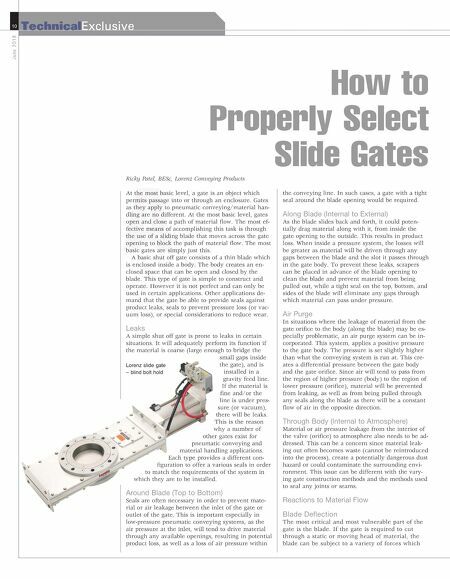 Internal deflectors and dead Lorenz slide gate – tube/pipe stub Lorenz roller gate Let us do the same for you. Hapman.com/pbs 888-840-8309 WE COULDN'T HAVE DONE IT WITHOUT HAPMAN. 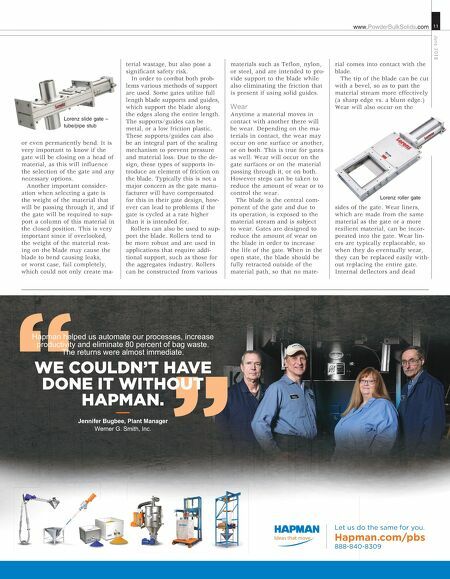 Hapman helped us automate our processes, increase productivity and eliminate 80 percent of bag waste. The returns were almost immediate. Jennifer Bugbee, Plant Manager Werner G. Smith, Inc.